Dr. Prieur du Plessis is chairman of the Plexus group of companies, which is a well established money management firm in South Africa, one part of which is essentially the Morningstar of South African mutual funds. And I am proud to say he is my South African partner. The stock market continued its downward trajectory during the past week, experiencing wild swings on the back of a barrage of bad news in the financial sector, and ongoing concerns about the housing and credit markets weighing on investor sentiment. This prompted Bill King ( The King Report ) to raise the following questions about Fed chairman Ben Bernanke's troubled facial expression: "How dreadful has sentiment about the economy and financial system become? If one picture is worth a thousand words, what are two pictures worth?" Bernanke's testimony before a congressional committee on Thursday reaffirmed the market's worries about the health of the economy. He admitted that the tumbling house prices, increased energy costs, falling consumer spending, increasing unemployment and weak stock market performance were more than likely to drag down US economic growth. Bernanke expressed his support for significant fiscal and monetary stimulus as a pre-emptive strike against a US recession. Despite these pronouncements the stock market plummeted by more than 300 points. On Friday President Bush broadly outlined a plan for roughly $150 billion's worth of tax breaks, rebates and unemployment benefits to boost the slowing economy and help stave off a recession. This announcement, however, could not prevent stocks from sliding further, especially as concerns mounted that the downgrading of bond insurers dealing in credit default swaps could trigger another wave of huge debt write-downs. "I hope I'm wrong, but I'm thinking that a large economic storm is building, and it's aiming to hit hard in the weeks and months ahead," said Richard Russell, 83-year old author of the Dow Theory Letters . Before highlighting some thought-provoking news items and quotes from market commentators, let's briefly review the financial markets' movements on the basis of economic statistics and a performance chart. Based on a recent CNN poll, it's clear that the priorities and worries of US voters (i.e. consumers) are changing. In a November poll, 29% were worried about the economy, 28% were worried about the war in Iraq, 18% were worried about healthcare, 10% were worried about illegal immigration, and 12% were worried about terrorism. In the latest poll, 35% were worried about the economy, 25% were worried about the war in Iraq, 18% were worried about healthcare, 10% were worried about illegal immigration, and only 9% were worried about terrorism. The bulk of the economic statistics reported during the past week, including soft retail sales, falling housing starts and a declining Index of Leading Economic Indicators, reaffirmed the US's economic woes and the precarious position of consumers. BCA Research summarized the implications for the Fed's meeting at the end of the month as follows: "While some FOMC members remain concerned about upside inflation risks, this will not prevent further major rate cuts. A stimulative Fed will not lead to an early improvement in the economy, but should cushion the downside." Source: Yahoo Finance , January 18, 2007. Next week's economic highlights include Initial Jobless Claims and Existing Home Sales on Thursday. 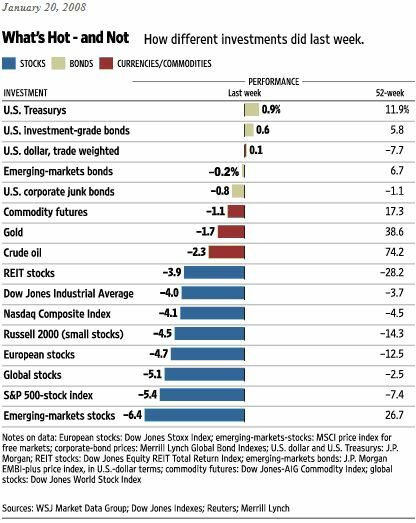 The performance chart obtained from the Wall Street Journal Online indicates how different global markets fared during the past week. Source: Wall Street Journal Online , January 20, 2007. Concerns about a US recession again clouded the financial markets during the past week and the subprime woes continued to unfold as more write-downs and depressed earnings were reported. The economy is non-linear. Non-linear equates to chaos theory. Chaos is one of Physics Foibles - non-predictable. Butterflies may cause tornadoes!! !